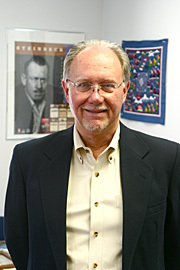 Dr. Tom Barden, director of the Honors Program and professor of English. He began teaching at the University in 1976 and was named director of the Honors Program in February. "Not only does he always lend support to his students, he also supports the community of local publishers, poets, writers, artists and musicians in their various readings and events," wrote one nominator. "He has worked with students at Libbey High School, formerly gave generously of his time as a board member of a local charter school for the severely behaviorally handicapped, and repeatedly opened his door for any number of current as well as former students by always encouraging them to follow their bliss." "Ihave a lot of faith in the things I study and teach - the novels and poems, the folktales and songs, and all of the other cultural materials an English professor gets to put on a syllabus. I love this stuff and I can't imagine a better way to spend my time than studying it," Barden said. "My goal in the classroom is to guide my students through it and to get across some of my enthusiasm for it along the way." 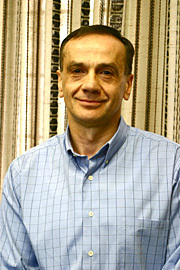 Dr. Zeljko Cuckovic, professor of mathematics. He has been at UT since 1994. "He has a dynamic personality, is extremely interested in student comprehension and success, and teaches in a very logical, clear and concise manner," wrote one nominator. Another wrote, "In Dr. Cuckovic's class, a C is equal to an A in any other class. It might seem kind of harsh, but think about that the next time you drive over a bridge or go to the fifth floor. Who would you want to crunch the numbers for those structures? I'm sure you would want an engineer who developed his/her sharp math skills under the direction of Dr. Cuckovic." "A thorough knowledge of the subject area is very important. I have taught a wide-range of classes, from college algebra to Ph.D. courses. No matter what level I teach, I always want to be well-prepared, but also leave room for improvisation," Cuckovic said. "Learning is an active process, and I encourage student participation and promote creativity as much as possible. I am a demanding professor but always try to be fair and help students as much as possible." 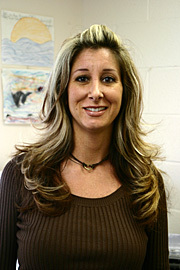 Dr. Lisa Pescara-Kovach, assistant professor of foundations of education. She began teaching at UT in 1999. "She is down to earth, makes topics easy to relate to, and is an all-around wonderful teacher here at the University," wrote one nominator. Another noted, "She is so involved with her students and is always looking out for them. Her class feels like home. She's fun, funny, serious, enthusiastic, interested, interesting and so much more. She loves her job, her students and children. She is a born teacher!" "I feel that teaching is one of the most important aspects of my life. My goal as an instructor is not only to teach the curriculum, but to create an environment in which students feel free to share their views on, and ask questions about, 'the subject matter,'" Pescara-Kovach said. "Most importantly, in the courses on human development, I want the student to leave with a respect for others' differences and knowledge in the fact that our life experiences, from infancy to adulthood, 'play a great role in who we become.' I model tolerance and acceptance in the classroom in hope that my students will live these values as well."